It’s a warm Tuesday afternoon and the Trampoline House's big classroom is filled with people eager to improve their Danish language skills. After spending a few minutes in the class, you quickly realize why it’s so popular. Signe is teaching today, and she is planning to talk about how to say the time and different time markers one can use. She passes out a helpful summary of everything you need to know to say the time in Danish and some worksheets. Danish class at Trampoline House is not your typical Danish class. In Signe’s words, “there are many different levels in Danish class at Trampoline House so we try to do some exercises where everyone can join. But at one point we split into two different teams, one for beginners and one for more advanced, because there’s a big diversity. There’s a big diversity in every way at Trampoline House but also in the level of how well people speak.” The class is very collaborative and democratic in nature as a result. The curriculum is more than just grammar or vocabulary: “We also really often try to focus on what people do in their everyday life. So that could be talking about transportation and how do you use the transportation in Denmark. Also some good sentences to know when you go to the grocery store or supermarket. 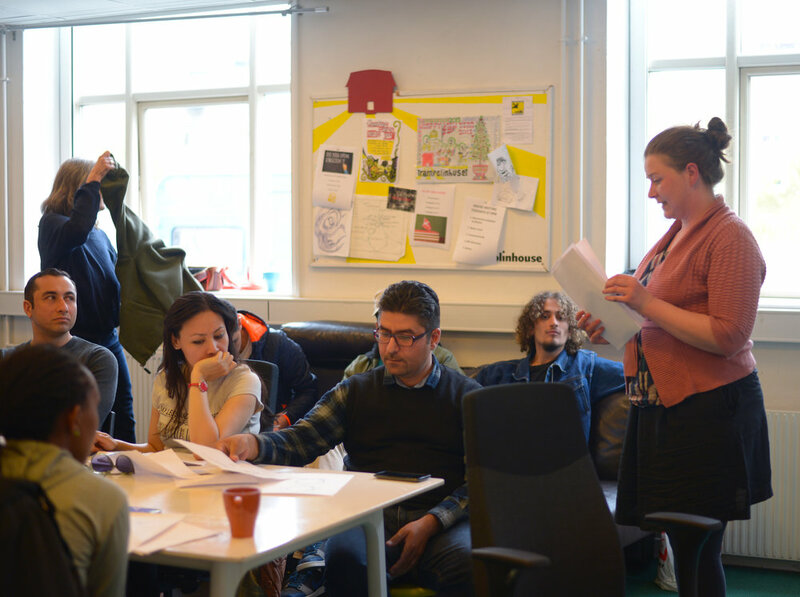 We try hard to teach with a focus on how to get by in Danish society in everyday life.” The class is all about making the transition into Denmark as smooth as possible and it even mirrors Danish society in its democratic teaching style! Danish class takes place every week on Tuesdays at 3-4 pm, and on Wednesdays and Fridays at 4-5 pm. Remember that you can see all Trampoline House's activities in our calendar.